Giuseppe Milo is an experienced Italian Street Photographer currently based in Dublin, Ireland. He has been studying photography and composition for a long time and has a good knowledge of the art. Even though he loves Street Photography he also enjoys shooting landscapes, architecture and events. In addition to being a Photographer, Giuseppe is also a Web Designer & Developer and an expert in many fields of the web. 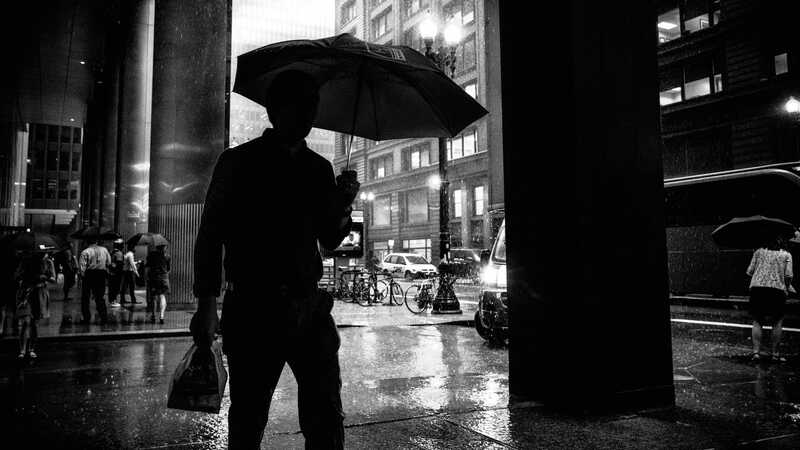 Being a creative person has helped him build an intruiging portfolio of street photographs that he shares on line through his Flickr account and his website. Giuseppe Milo enjoyes traveling and wherever he goes he always takes pictures, making his collection very interesting to study. You can see more of Giuseppe Milo’s photographic work on his Flickr page https://www.flickr.com/photos/giuseppemilo/ and on his website at http://www.pixael.com/. 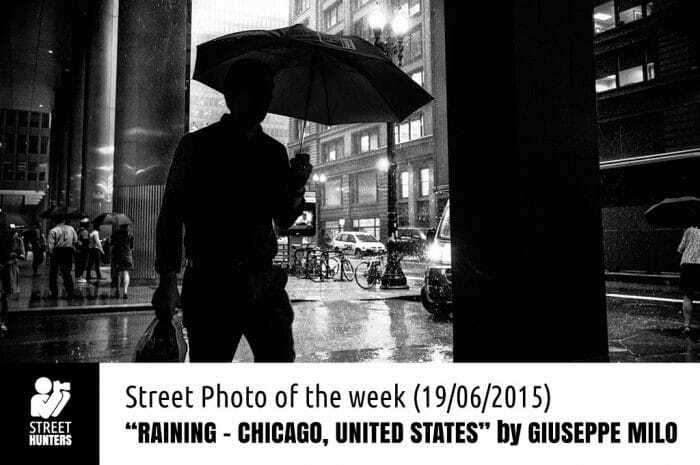 This is a beautiful Street Photograph shot in Chicago USA. Giuseppe has managed to achieve a wonderful result by taking advantage of the available backlight. The placement of the main figure in front of the light enhances its silhouette giving the photograph a cinematic film noir kind of feeling that is of course further emphasised by the fact that the photo is in black and white and also shot in a 16:9 format. The umbrella is perfectly placed between the two most prominent columns that are a basis of a bridge or a big building – we can’t really tell. Its edges are a breath away from either vertical. The front most prominent column is also silhouetted like the main figure and is placed in the right hand vertical of the photo. The left side of the man touches upon the other vertical on the left, balancing the photo perfectly in the eyes of the viewer. Giuseppe timed his shot to the millisecond, managing to get the best possible composition with the least interference. If he had shot this a split second later, the umbrella would have been one with the right hand column and a big van would have dominated the background. As you know, every Friday we feature a photograph of a Street Photographer on our website. The Street Photographer that is featured is selected by the Street Hunters team. If you would like to have one of your shots featured on our website, then please contact us by visiting https://www.streethunters.net/contact/, or join us on our Flickr Group or subscribe to our GooglePlus Page.